I will admit that my new drawing looks hardly like Madhubani. 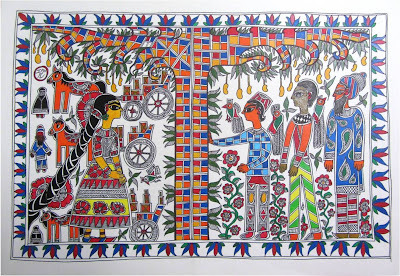 It is very nontraditional but I'm posting it on my blog because it still maintains many Madhubani features such as double outline and heavy border. This drawing is divided into two parts. It is black and white and the theme is another realm. 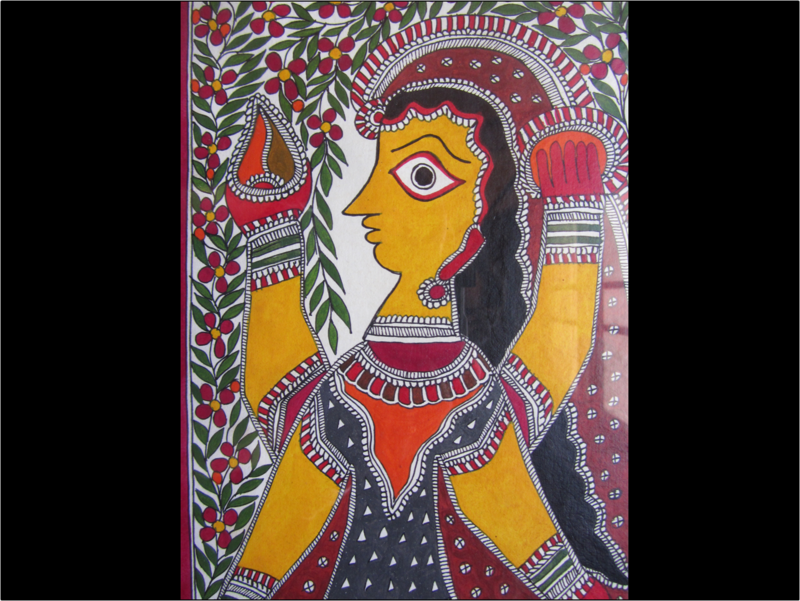 As Madhubani art mainly focuses on Hindu scripture Ramayana and depicts gods and deities, I chose to depict deities in this painting too. The deities on the left side are fictional and the deities on the right side might be recognizable by most. This painting strongly reflects my belief system where I am very open to all religions and all traditions. I like the idea of saints from different religions meeting up in one drawing, communicating, interacting, sitting beside each other etc. Today is the second day after Diwali and the small Madhubani painting I made on Diwali night is still in our aangan (front-yard). The cleaning lady haven't scrubbed it off yet and hopefully it will stay there until the next Diwali. I have painted this small painting on the marble floor using acrylic/fabric paint, the same I use for painting on paper and on cloth and if not scrubbed bu force, it tends to stay for as long as a year. I know it because my mother-in-law makes Laxmi's feet every year and it stays until the next year. Today my mother-in-law, our neighbor and I went to Shilp Utsav Fair in Noida. We do this every year. India's biggest yearly festival Diwali is approaching and so we like to shop some diyas (clay candles), Laxmi and Ganesh tiny sculptures, decorations that say "Shubh Diwali", warm shawls and some Andgra Pradesh suits. The stuff is amazing and I always wish I had more money and no matter how much money I bring it's always too little. This time I actually thought about avoiding visiting the fair because it makes me feel bad when I cannot buy 10 Kashmiri paper mash boxes each worth 600 rs. Exactly the same thing happened with the Madhubani stall. It had a ton of amazing paintings and black and white drawings ranging from 50 to 10.000 rs. The finer the work, the more expensive the painting is. It can be small in size, it can be black and white but line work is the thing that decides whether the painting will be expensive or not. As my budget was pretty limited, I just bought 6 bookmark size fine paintings. The First Painting I Chose. It looks the most antique and has "OM" written on the back. 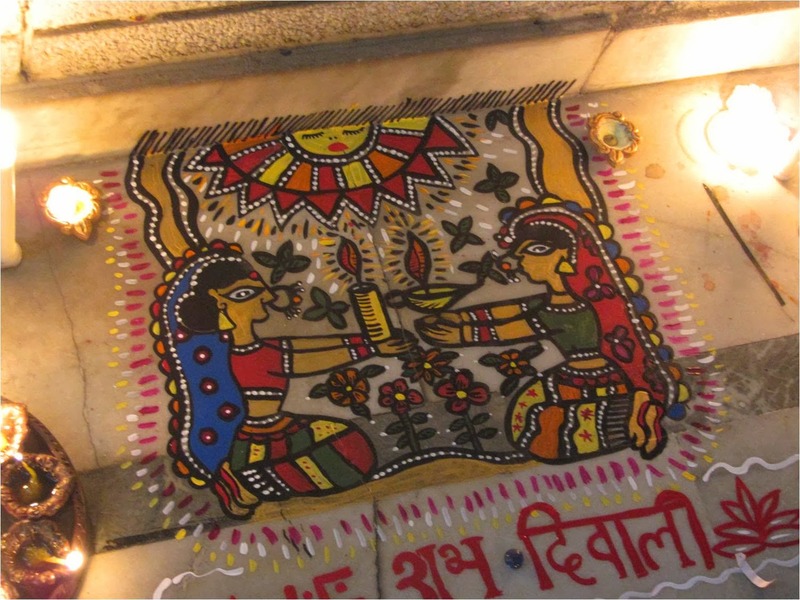 The stall owner said it was made by the descendants of the famous Sati Devi. 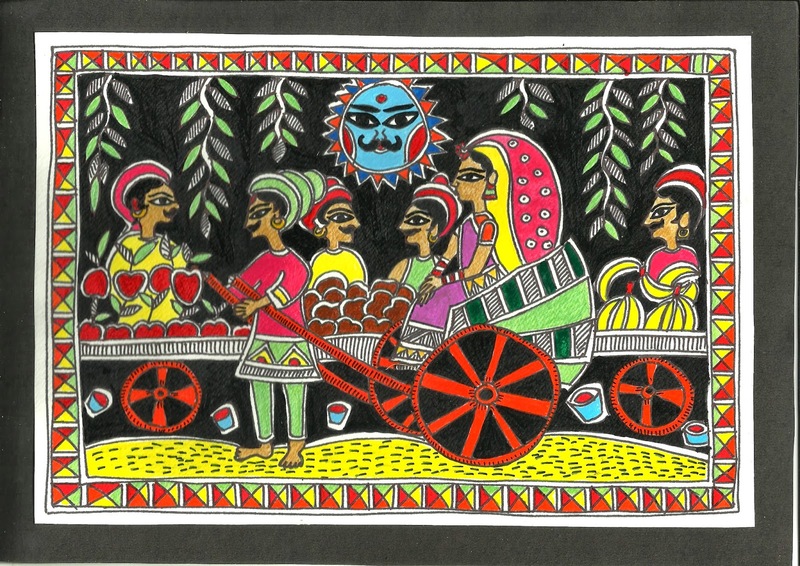 There was my mother-in-law's birthday last week and I ended up making a Madhubani inspired painting of Sunday Bazar. If you don't live in India, you might not know what is a Sunday Bazar. Bazar means market and this is a roadside market that keeps traveling from one city area to another all week long. In my place it is always a Sunday Bazar, in the other end of the city it would be Wednesday Bazar or Monday Bazar. Shopping is a necessity and a pleasure as well. That's the time when my mother-in-law connect the most and have the best time together. Sunday Bazar usually sells fresh fruits and vegetables, plastic buckets, bangles and hair clips. Even if we are lazy and don't feel like going to the Sunday Bazar, we have to because there is no any other shop around where we could get vegetables that cheap! This is the weekly shopping and it's the most important one. When making a Madhubani greeting card for my mother-in-law I first thought just to make a miniature one with a couple of elephants and cows but what story could they tell? I decided to make a drawing that would tell a story that would connect us in some way. The vegetable market theme was definitely the best one! 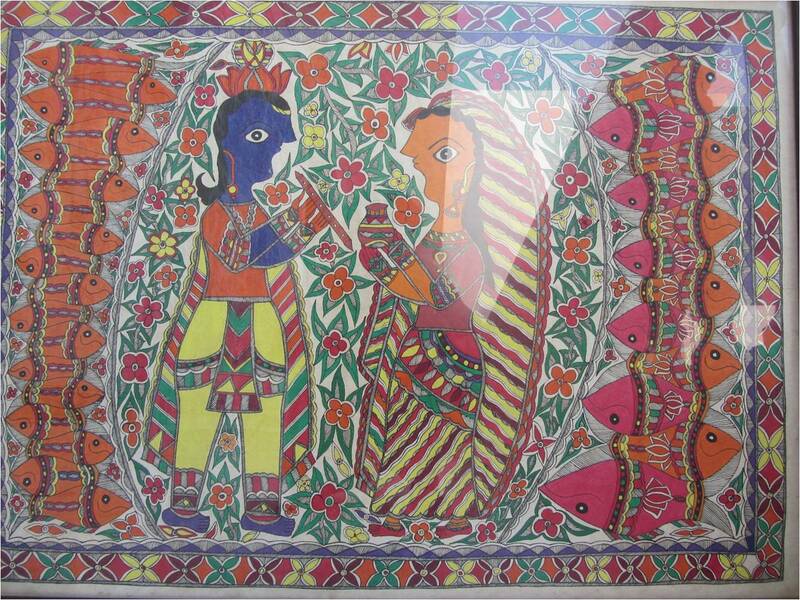 The other Madhubani painting that I bought from Mr. Jha in Delhi Hath was also of "Radha-Krishna" sitting in the tree and it also had loads of fish on the sides. 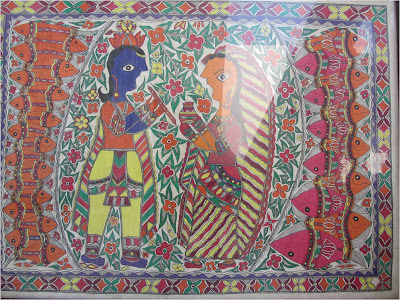 This painting had "Radha-Krishna" standing in the center surrounded by fish and flowers. There was loads of lemon yellow and I particularly loved the combination. COPYRIGHT NOTICE: None of the pictures can be reproduced, printed and/or sold online or in any other way. These pictures are only for educational purposes and personal use. The art is not by me but by Namita and Dharamnath Jha. The first time I bought Madhubani paintings was in 2012 in Delhi Hath (Dillii Haath). This is the place where you can see many tourists and many foreigners. It is a closed bazaar and you have to buy a ticket. Inside there are many stalls and shops where artists from all over India sell their handicrafts. The most popular products would be bead jewelry, metal rings, bracelets, bangles, Indian clothes and textiles, Punjabi and Rajasthani shoes, shawls and carpets. There are many restaurants that sell street food as well. 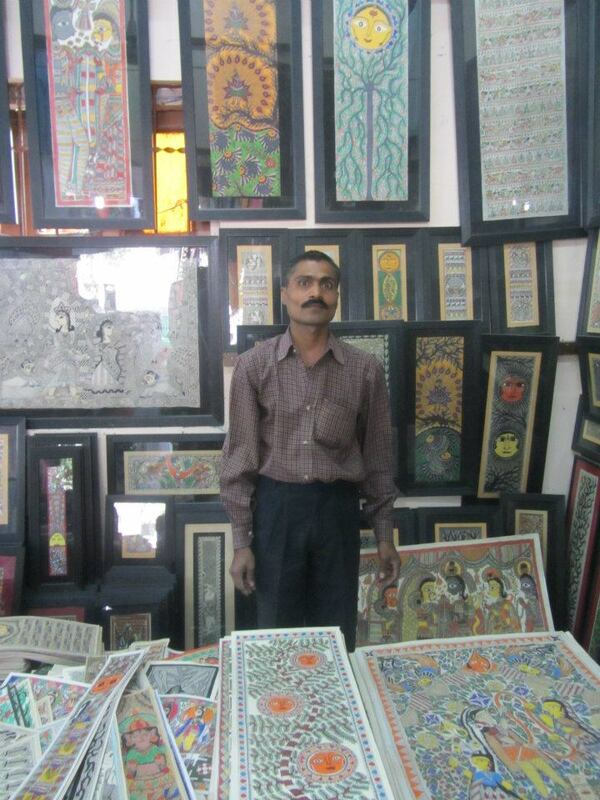 One of the first shops is the Madhubani art shop and it always attracts many people. That's not the only one shop! If you walk further, you can see two or three more shops and the style of art differs. 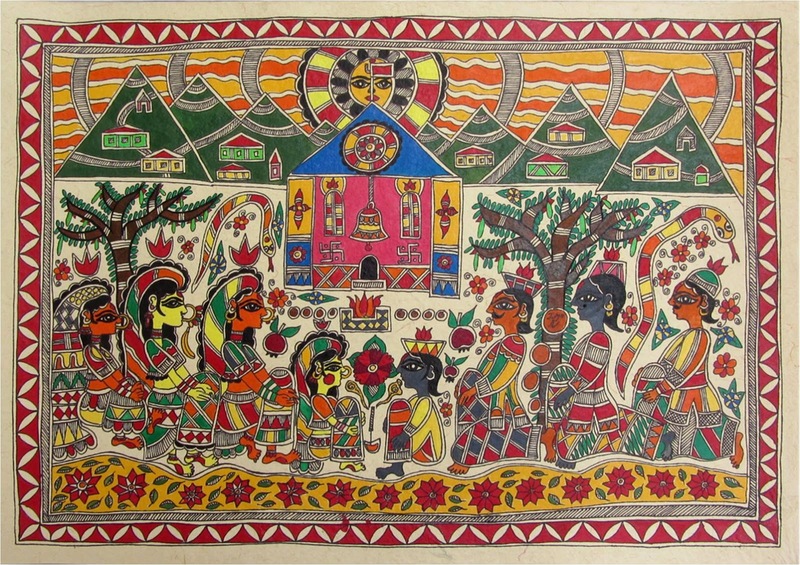 It is really possible to find your type of Madhubani painting. This is the artist from whom I bought my two A1 sized paintings. Later, the painter gave us a business card where the names identified were Nanbita Jha and Dharamnath Jha. I suppose that these are the names of the artists (or other family members) that made these paintings. 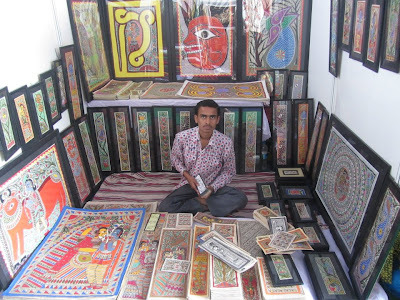 From time to time we get to visit folk art fairs in Noida. These fairs happen all over India. 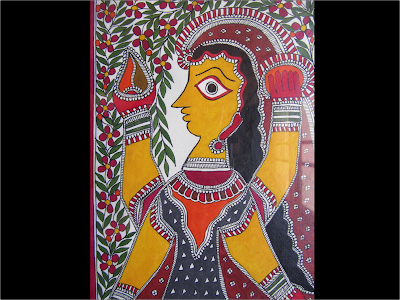 It is possible to buy Madhubani, Rajasthani Phad, Orissa and other paintings and handicrafts. In this post I want to show you small sized Madhubani paintings (half A4 size) that I bought for hundred rupees each. The unfortunate part was - I didn't have much money with me so I was happy to at least get those. 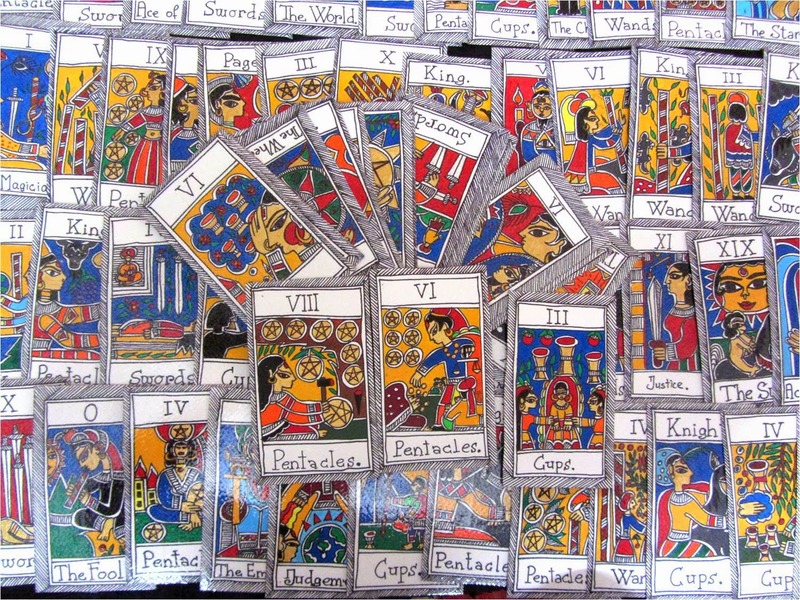 In this blog post I am going to quickly introduce Tarot cards for anyone who doesn't know what that is. 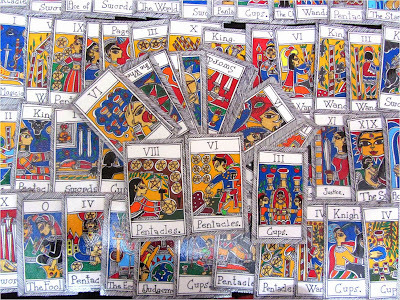 Also I am going to share my Madhubani inspired tarot cards and explain how to make them and use them yourself. While on a trip in Ludhiana, I drew Madhubani border designs in a hotel room - so much fun! These designs are like 43 Madhubani Border Designs that I made while copying other people's borders in order to learn. I just really enjoy drawing simple designs. If I have used your design on my blog and if you'd like me to write your name below, please contact me and I will give the necessary credits. Materials used: permanent marker (black), handmade paper, pencils and crayons. The colors are unchanged, the tone might vary, the design proportions may also vary. 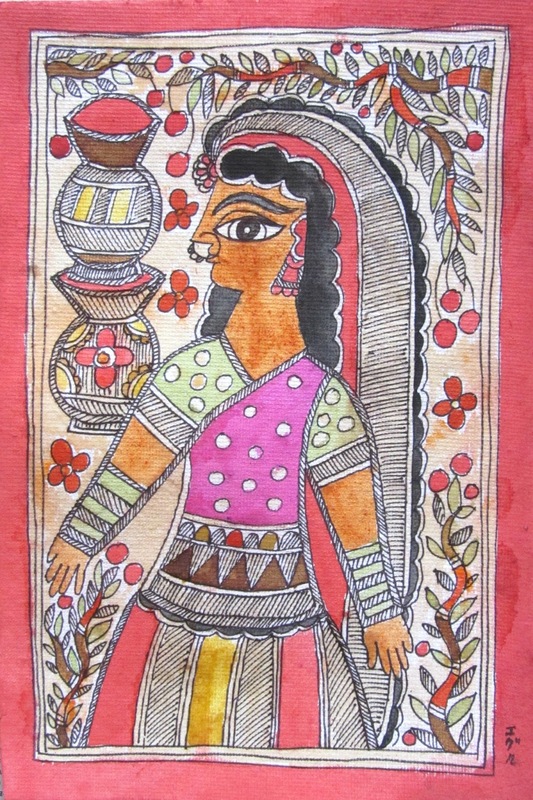 A few days ago I went to our neighbor's house and took their all Madhubani paintings home. I wanted to copy them and in this way to understand the technique and the style of the painter. These all paintings were bought several years ago at the Delhi Hath. Sadly I don't know the name of the artist but the paintings are completely adorable. 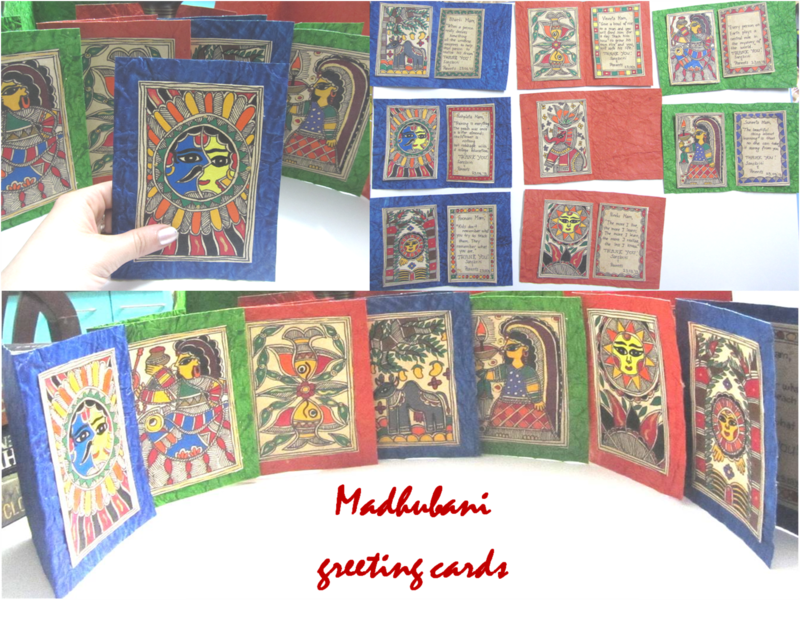 The other week I felt like making some Punjabi phulkari, Rajasthani and Warli inspired Madhubani style bookmarks. 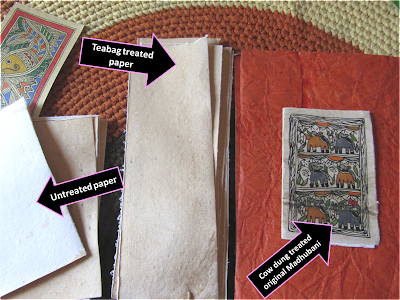 These are very small, narrow strips of handmade paper and the designs made are very simple. 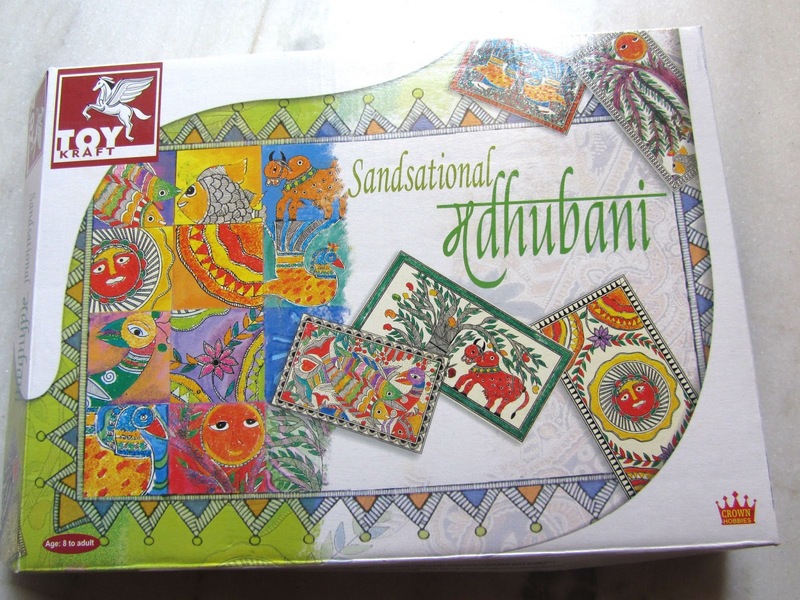 Madhubani Craft Kit on "Toy Kraft"
You can buy all of them at these Indian websites: www.toy-kraft.com or www.flipkart.com for the price ranging between m 200 rs to 600 rs. 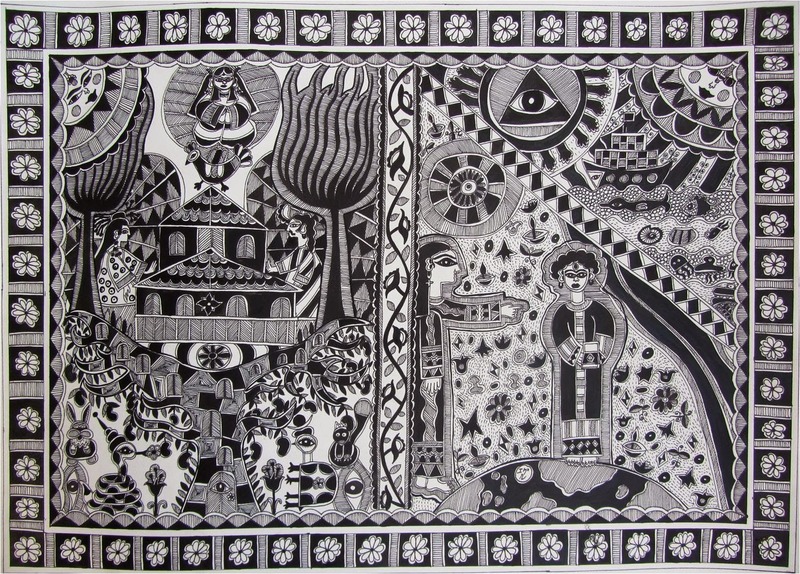 There are several ways of making black color at home that I have been told by Bihari artists. One is using soot and cow dung, the other one is - mixing soot with gum with hot water and the third one is mixing soot with resin and hot water. So we are not sure whether these are the proper ways to make black color in Madhubani village but we have done some experiments using mentioned ingredients. Making black color at home is not a big deal, one can just use a black ink, or a Japanese ink stick however I want to use the same materials that the poorest villagers use in order to make incredible paintings. Madhubani artists usually treat their handmade paper with the cow dung. I have never tried doing that myself, although I can get fresh cow dung very easily. Apparently they would simply mix it with water and then apply onto the paper with a broad brush. All the unnecessary pieces of grass would automatically fall off when the paper is dry. This process would give the piece of paper a nice brownish earthly look or even remind you of a cow dung treated village hut. WHY MAKE A HANDMADE CARD? When I was small my mother told me that anything that is handmade carries a special energy in it. Nothing can express your emotions such as gratitude or love better than something made by you! Since that day I started making cards only for those who could appreciate but at times I cannot help but feel a need to make a handmade card for strangers as well. Sometimes it's important to say things out but we might not find the right way to do it. For me, drawing is this medium and although it's not a professional drawing, it still does the job. When I entered the kitchen today I suddenly felt like making natural colors. It has been in my mind for some time that turmeric (haldi) would make a perfect yellow. It was so adventurous that I decided to record the process. The following is the A4 size painting painted using natural colors. This A4 size lady painting has been painted using colors made mainly from food. The skin color was made out of Kashmiri chilli powder, the yellow color from turmeric, green leaves from fenugreek leaves, hair from coal, dark brown from coffee, light brown from tea (background), flowers from food color powder, ochra brown from henna, pink from beetroot (after fading I applied Holi color powder), red border and berries from kumkum + Holi color. 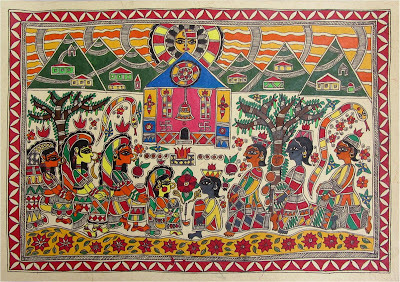 One of the best ways to practice Madhubani is to draw its designs on small pieces of handmade paper. That's what I was doing during the weekend as a relaxing time-pass. 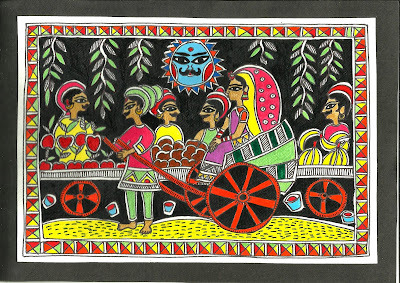 All of them are copied from Madhubani works I found on the Internet and although I drew them, their copyright doesn't belong to me. If you are the creator of one of these designs and would like to be given credit to, please contact and I will give the necessary credit. Commonly, only lines are used as a border, usually only 3-4 lines. 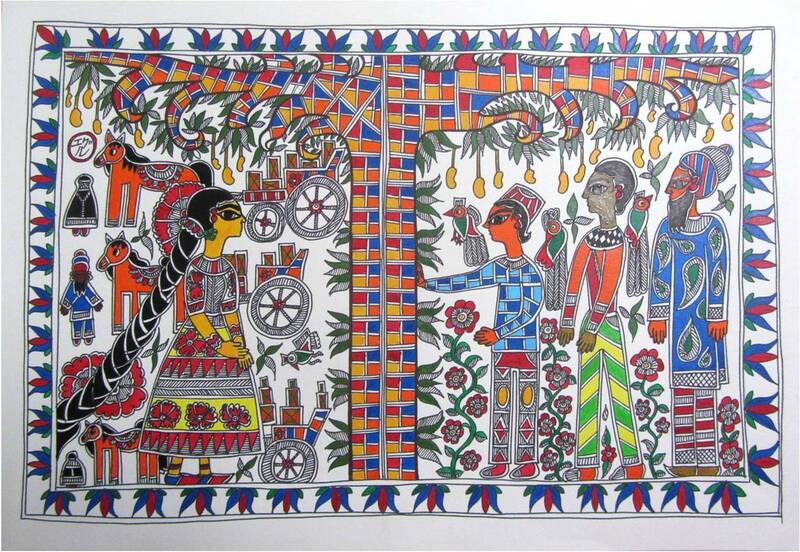 "Madhubani Must Be Learnt, Not Developed"
After a series of experimenting and trying to reflect modern themes within the Madhubani style, I suddenly felt that I am completely unsatisfied with the outlook. As we can see in my two previous non-Indian based Madhubani themes, there is something that doesn't "feel" Madhubani at all. 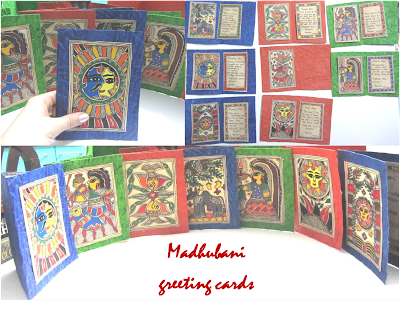 That really made me research online and I googled "books on Madhubani" in order to learn at least a little bit more about Madhubani. There I found an old edition of "Madhubani Painting" by Upendra Thakur. 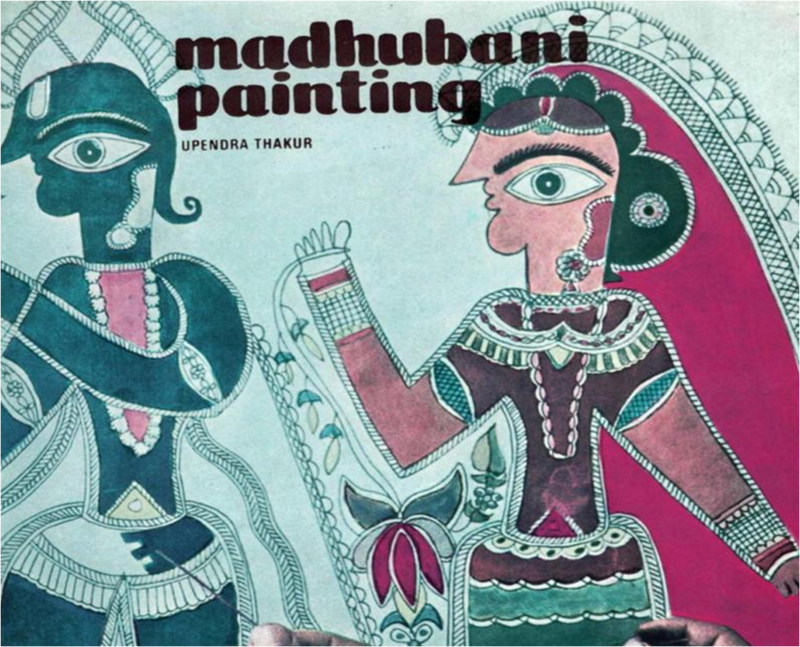 I was able to view about half of the book and it didn't provide me with a lot of insight but I was able to learn one major truth - "Madhubani style must be learnt, not developed". This is the second illustration for a scene from E.K.Antariva's novel "Two Lives". The action takes place in Central Asia, in one of the "-stan" countries during the 19 century when tsar was in rule in Russia. The theme depicted is not India related, however it's not far from India either. It might be the old Afghanistan or Uzbekistan.